And there’s only a 50% chance I’ll actually make something from them. For no particular reason. It’s more about gazing at the pages, photographs and colors with hopes to draw inspiration for my own cooking. I like to hear the author’s voice. I like to look at their kitchens and see where they live. And those personal snippets under each recipe? My favorite. Today, I’m branching out. I’m cooking the book. This recipe is from Jamie Oliver’s latest masterpiece: Jamie’s Comfort Food. Ironically, I don’t even own the book (Santa’s getting it for me). I snagged the recipe online. And let me tell you, it’s epic. 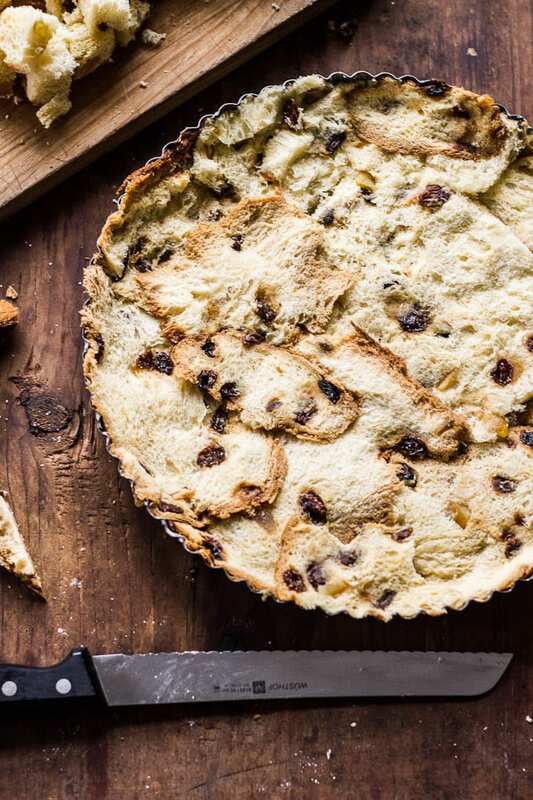 He takes store bought panettone, soaks it in creamy custard, and bakes it in a tart pan until puffed and golden (we can stop right there if you want). Lashings of orange marmalade and chocolate are tucked into the mix. He even sprinkles the tart pan with sugar, creating a crispy crust that encases a soft, pudding-like center. Find yourself a 10 1/2 0r 11-inch tart pan with a removable bottom. Grease the entire thing with butter and sprinkle with sugar. Jamie uses Demerara sugar, which is a coarse grained sugar commonly found in recipes throughout the UK. If you can’t find it, our equivalent would be Turbinado or Sugar In The Raw. I also wrap the pan in aluminum foil to prevent any custard from leaking through the bottom. To make the base, cut the sides off the panettone with a serrated bread knife (it’s just like slicing a pineapple). Use the slices to line the bottom and sides of the pan. Gently press them together until compact. This is your ‘crust’. Cut up the rest of the bread for the filling. The custard is a mixture of milk, butter, sugar, free-range eggs and vanilla. Jamie also adds double cream, which is different than our standard heavy cream. It has a higher fat percentage. It’s also a lot thicker. Since double cream is difficult to find here in the US, I used creme fraiche instead. There is a low-fat version which is pretty good. Pour 1/3 of the custard into the base of the tart. Let it soak. Then, add the rest of the bread cubes to the bowl. To assemble, layer the soaked bread with dollops of orange marmalade and chocolate tucked in between. Go rustic. Jamie insists on not being a perfectionist; you’re looking for a variety of textures throughout. I did everything with my hands. Sprinkle a little more sugar on top, and place the tart onto a rimmed baking sheet. I broiled mine for a couple of seconds at the end for extra crunch…. Cool slightly before serving. Cut into wedges. Now, based on availability I made some substitutions to Jamie’s original recipe (both versions listed below). My custard is made without double cream, I decreased the butter, and used chocolate chips instead of chunks. It was still amazing. More than amazing. The chocolate-orange combination is out of this world. The texture of the panettone is divine. And that sugar crust! I die (again). I served this tart on my new Winter’s Eve Collection from Q Squared NYC. I’ve been waiting months to use these festive pieces! 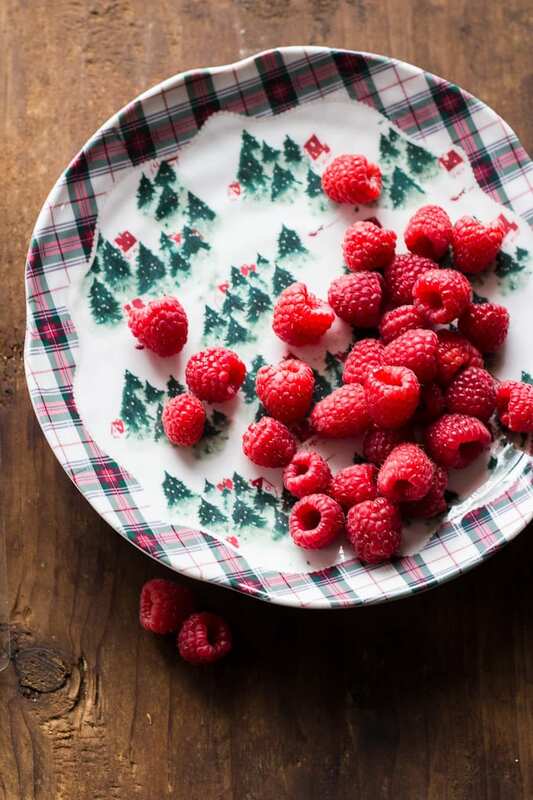 Who doesn’t love a little holiday plaid? I hope I did you proud, Jamie Oliver. * You will need a 10½ or 11-inch tart pan with a removable bottom. Preheat your oven to 350 F. Wrap the tart pan in aluminum foil. 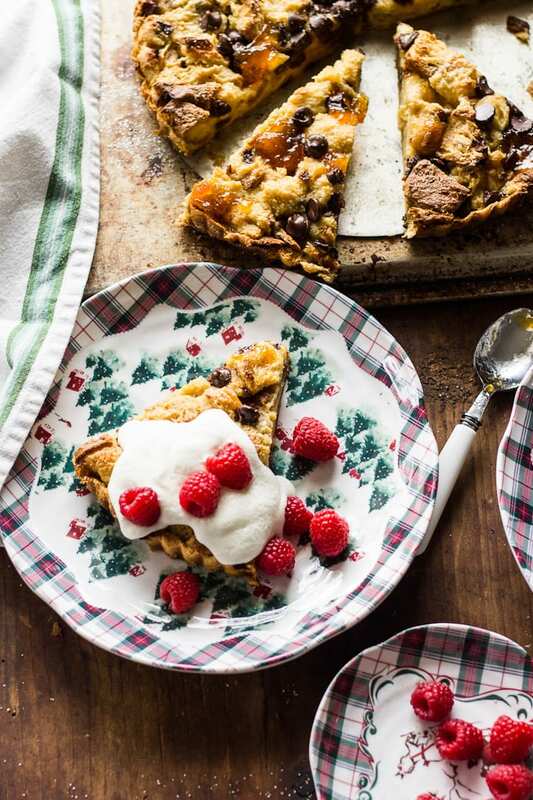 Grab a rimmed baking sheet. 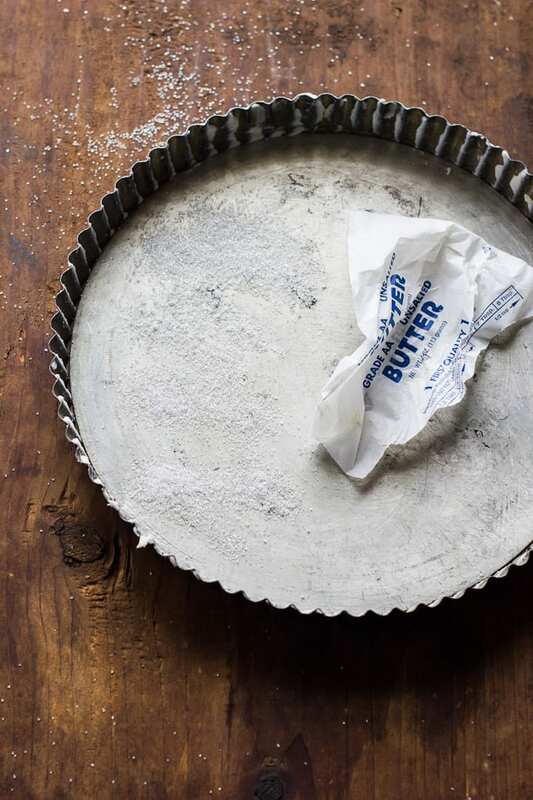 Grease the tart pan with butter. Bash 2 tbsp. of Turbinado sugar in a pestle and mortar, then mix back with the remaining sugar. Add the sugar to the pan, shaking it around to coat. Slice the sides off the panettone using a serrated bread knife. Use these pieces to line the bottom and the sides of the tart pan. Press together gently to compact. Cut the rest of the panettone into large cubes for the filling. For the custard, slice the vanilla bean in half lengthwise. Use the back of a knife to scrape out the seeds. Place the vanilla into a pot with the milk, creme fraiche, and butter. Simmer until the butter has melted. Remove from the heat. In a large bowl, whisk the eggs and sugar together until smooth. Whisking constantly, slowly pour the warm milk mixture into the eggs. Do this a little at a time so the eggs do not scramble. Remove the vanilla bean. Pour ⅓ of the custard mixture into the base of the tart to soak. Add the rest of the bread cubes to the custard and soak briefly, about 30 seconds to one minute. 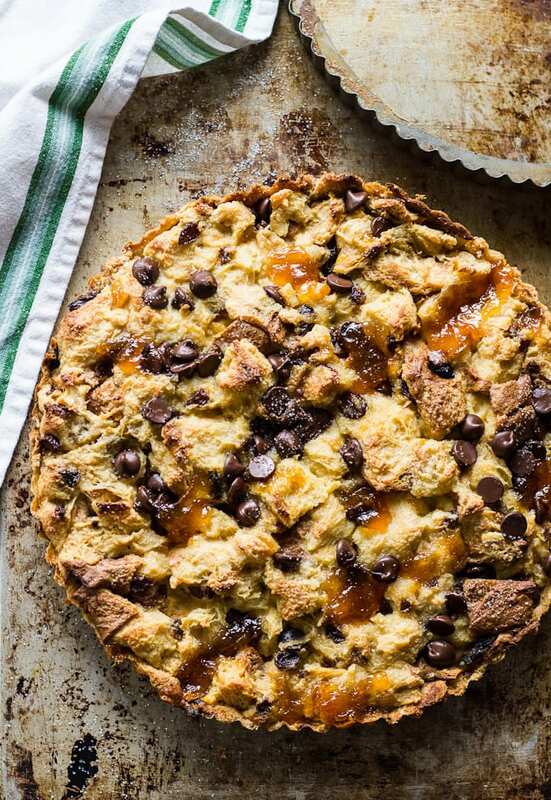 To assemble, layer the bread with dollops of marmalade and chocolate chips tucked in between. Don't worry if it's not precise! The idea is to achieve a range of textures. Place the tart onto a rimmed baking sheet. Sprinkle the top with the remaining Turbinado sugar. Bake in the center of the oven for about 25-30 minutes. The tart is ready when puffed and golden brown. Let the tart rest for 10 minutes before serving. Remove from the tin and cut into slices. 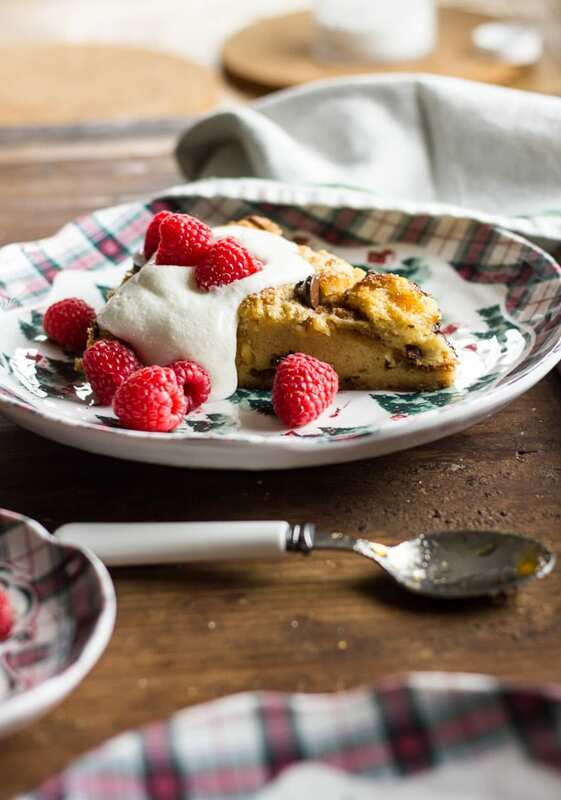 Serve with whipped cream, powdered sugar, or ice cream and berries. You made my mouth water!! Excellent! This tart is wonderfully decadent. I hope you enjoy! Gorgeous shots, and, dare I say it, an epic small world! Every year I am faced with lots of panettone after Christmas. I make French Toast, Bread Pudding, Coppette di ricotta and something very similar to this using Mascarpone, mixed into the slightly cooled custard base, and a nice Sicilian blood orange Marmalade. (I leave the dieting until after January 1!) Each time I come to your site I find that we are on a very similar wavelength, Emilie. It fascinates me! Best wishes for a very Merry Christmas and a Happy New Year! Adri, you know my blood runs Sicilian blood orange marmalade, right? It is no surprise we’re on the same wavelength! Mascarpone would make a lovely addition. If you try this recipe someday, do let me know. 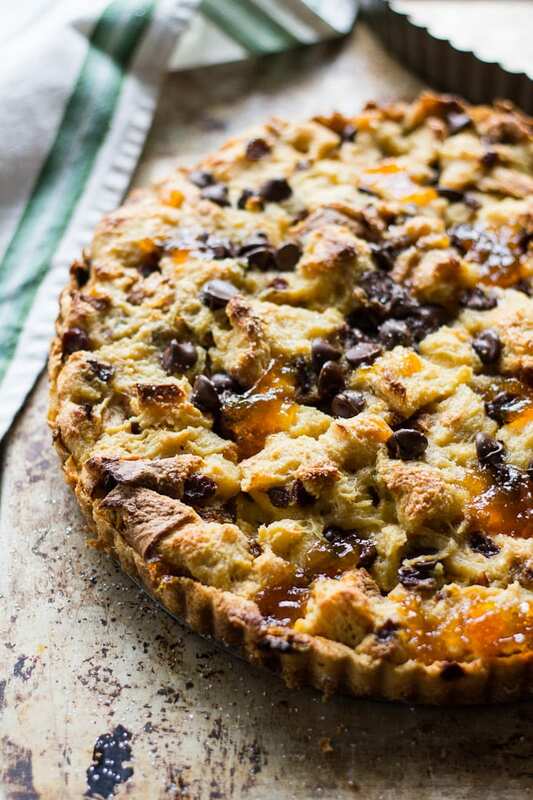 The chocolate-orange combination is a wonderful play on panettone. Drooling over the recipe and the photos! Just gorgeous! This is perfect for using up the panettone gift from Christmas I received! Oh yes I’m a hoarder of cookbooks, I love them so so much. I have been thinking a lot about cooking from specific cook books more, like I did in earlier days of blogging. I have one Jamie Oliver cookbook and I love it. I also love panettone, reminds me of home! This looks delicious! What Jamie book do you have? I own a bunch myself. Jamie at Home is one of my favorites. It’s interesting to see his style evolve over the years. Have a wonderful holiday, Aggie! Haha… I’m not one to hold back on adjectives when it comes to food. It’s funny, because it’s exactly how I described this dessert to my mom over the phone the other day. She goes- you have to say that! So I did. I hope you have a beautiful Christmas with your family, Kelly! Happy New Year! Lots of love! Looks decadent! Beautiful styling and photos Emilie! Ah, thank you Selma. And guess what? I also have that Bill Granger book… Have you made his blueberry butter cake (I think that’s what it’s called)? It is amazing. I highly recommend. Panettone has never looked better, this is gorgeous! Oh my goodness, this sounds wonderful. Beautiful photos! Also a cookbook hoarder – my husband keeps asking where we are going to put them if I get any more! Oh Emilie, this is such a beautiful, mouthwatering …. dessert? snack? breakfast? All of the above! 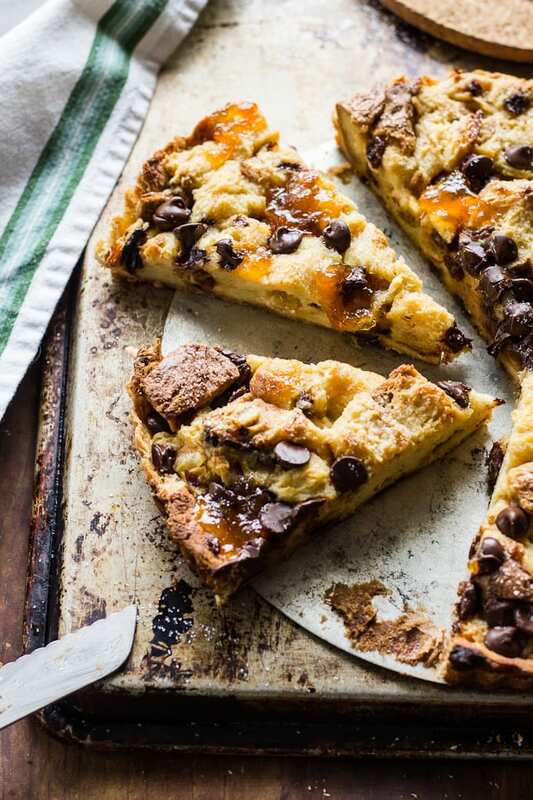 It’s somewhat like a bread pudding tart, kind of… Leave it up to Jamie, right? I’ve yet to own any of his cookbooks, although each time I make a recipe of his from the web, it’s always fabulous. I’ve just decided, that his cookbook will be next on my list. 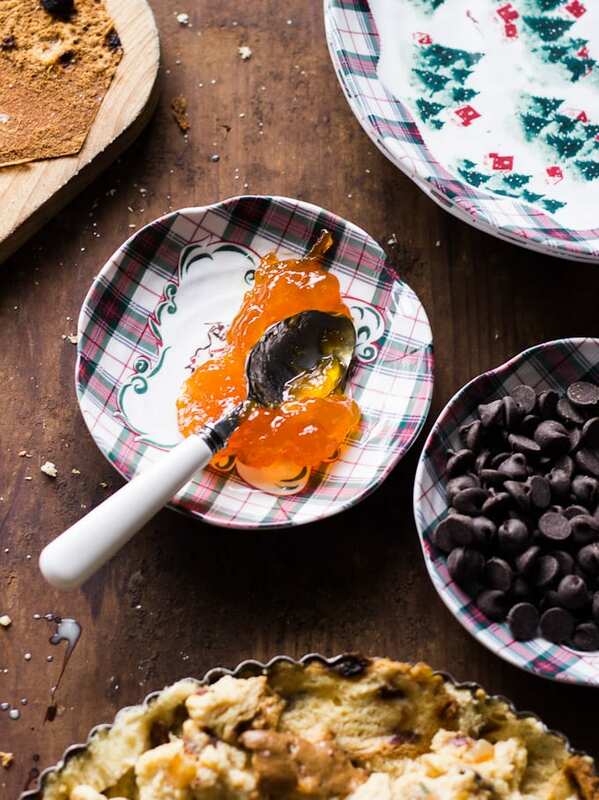 Love the marmalade, chocolate and creme fraiche… against that panettone (oh my!). Thank you for your inspiration! Have a fabulous holiday, Emilie! Jamie Oliver is brilliant. I own many of his books and each one is geared towards a different level of culinary skill- there’ something for everyone! Plus, he’s super creative and just all around different. Which I appreciate. My favorite book which I think you would like too (tons of veg. recipes) is Jamie at Home. I’ve been looking for this recipe for days, and now I just found this wonderful post! I tried this cake as a tribute to my mom, who recently passed away, as panettone cake was a favorite of hers. We were celebrating her birthday and used one of her cakes to try this recipe. It was rich and delicious! But I found out for true enjoyment it should be served slightly warmed as the texture is so much better! I had made it in the morning so served it up to guests in afternoon at room temp. It was really good…the next morning I decided to have a piece for breakfast. I had stored in frig so microved a slice for 30 seconds. Oh what a difference! It must have puffed up the custard a bit so the texture was not as dense and then the chocolate bits were also slightly melted. Way better experience!! Actually in the video of Jamie making this recipe he uses a Pandoro not a Panettone – they are different. Pandoro has no raisins nor candied fruits. I made it with Pandoro 3 times now and I find it super yummy. I made these but did Jotnhave crime freiche instead I only used half and half ani no milk! It is so delicious! Thank you for sharing oh and I used cranberry sauce leftover since I did not have any marmalade . Definitely will do these again! Hi Emilie- I came across this fabulous looking recipe while doing a little research for an article. 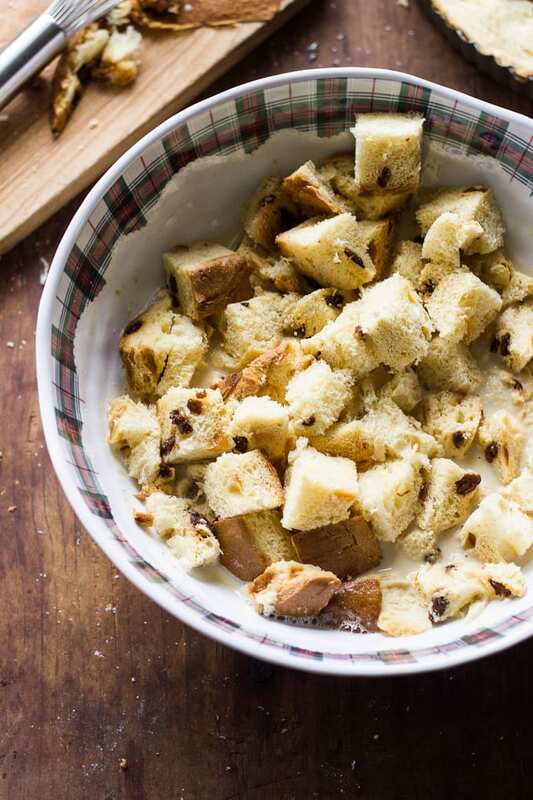 I’m a contributing feature writer for L’italo-Americano and am working on a little piece of how to make “proper” use of all that leftover panettone! If the article is published, would it be possible to make use of one of your photos from this post? Of course, full credit would be given. Thanks for your consideration, and thanks for a great post!